Fixing Climate is both interesting and useful but not in the ways that the authors intended. That’s not entirely their fault, since climate science and mitigation have changed enormously in the ten years since it was published. The book tracks the life and work of Wallace Broecker, who was born in 1931 and was just the right age to become a pioneer and then a leader in the (then) very young field of climate history and (hence) climate change. At the time of his birth, both Wegener’s theory of plate tectonics and Milankovich’s eponymous Cycles were new (and highly contentious) science. As a graduate student Broecker ran one of the very first radiocarbon dating labs at almost the same time as Keeling was making the first accurate measurements of atmospheric CO2. His Ph. D. put the first firm dates on the end of the most recent Ice Age, while Keeling was busy setting up the Mauna Loa CO2 measuring programme. Later, Broecker worked on the first ice cores which revealed good dates for past ice ages, and by the end of his career he was looking at the mechanics of abrupt climate change and ice sheet collapse. Broecker died just a few months ago, in February this year, so his lifetime spanned almost the whole development of climate science up to and including Mann’s Hockey Stick, the IPCC reports, the Kyoto and Paris agreements and, very recently, a model simulation of the past three million years of climate change. Putting climate science in that very human timeframe was an eye-opener for me: although I have been reading about its progress for at least twenty years, I was never really aware of the shortness of its prior history. 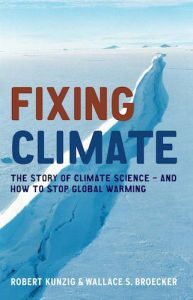 The bulk of Fixing Climate, then, is an informative and engaging history of climate science, deftly introducing many leaders in the field and explaining their contributions to it. The rest (primarily the section which gives the book its title) is problematic but still interesting. For one thing, there is hardly a single word about the politics of climate change or the misinformation campaigns of fossil fuel producers. Fixing Climate appeared a couple of years before Merchants of Doubt, true, but nothing? Finally, it’s actually pleasing that their conclusions about renewable energy were so far wrong, since it highlights our potential for surprisingly fast progress. This is an expert reviewer’s response to the book in 2008. Wallace Smith Broecker, the ‘grandfather’ of climate science, leaves a final warning for Earth. Days before his death, Wallace Broecker urged scientists to consider deploying a last-ditch solar shield to stop global warming. In a paper published today in Science Advances (Williet et al., 2019), we were able to reproduce the natural climate variability of the whole Quaternary with an Earth system model of intermediate complexity. Besides ocean and atmosphere, the model includes interactive ice sheets for the Northern Hemisphere and a fully coupled global carbon cycle and was driven only by changes in orbital configuration and different scenarios for slowly varying boundary conditions, namely CO2 outgassing from volcanoes as a geologic source of CO2, and changes in sediment distribution over the continents. Another look at the surprisingly fast growth of wind and solar power (in the US, at least) – https://blog.ucsusa.org/john-rogers/clean-energy-progress-graphic – with a smart graphic. It goes from about half of one per cent in 2008 (making the book’s stance quite reasonable at the time) to about nine per cent in 2018. If that growth is truly exponential and continued to be so, renewables would double every 2.5 years and hit 100% in less than ten; that isn’t possible, because we are sure to hit limiting factors of one kind or another, but 50% in less than ten years seems perfectly achievable.